It was funny how similar in sentiment Hugh and my Valentine's cards were. They essentially said "I don't know how the hell we are going to pull all of this off, but I have you, and that's the only reason I believe we're capable and I won't die in the next few months." We get the keys to our house tomorrow and it's safe to say both of us are equal parts scared and excited. This apartment, my first home with Hugh, is tough to leave. I'll miss the excessive pantry space here and my favorite routine beach walk. There are quirks here that in their own weird way contribute to it feeling known and ours - like all the stray cats that hang out in the front area, especially when they're mating (it's true, we call it the cat brothel, you've never seen anything like it), or the little old lady whose kitchen window looks right into ours who I try to not make eye contact with while I am eating something standing over the sink. We made our first book here and I showed Hugh my long awaited positive pregnancy test on those front steps. I just wrangled down the Christmas lights we've had framing our front door since our first month here, which we intentionally left up year round because every once in a while it was nice to come home to a sparkly welcome. The ice cream truck that consistently makes a neighborhood round at about 6pm. I assume it's his second job with those hours. They aren't exactly prime time for street-side ice cream purchases. I wish I had bought something from him just to show support. We built a life here and established roots in our first few years of marriage. I know this home well and in the throws of change, it makes leaving the familiar that much harder. We are on to new pages of another chapter, and moving forward offers its own set of rewards I'm looking forward to knowing. My thoughtful friend posted this quote on her blog and I love it, I keep going back to it. I am a lady who likes a plan, a substantial nest egg and having a general grasp on what to expect. They're bad habits, really, when you hold on to them too tight. I think there will be some sort of freedom from releasing those safeties as this settles into my bones. Because this week will mostly be between places, moving and cleaning and painting and such, I tried to stock the fridge with foods that can be assembled in five minutes. Sandwich goods, granola bars, cut fruit and veggies and a salad like this one that will hold up well for a few days of quick meals. It's crunchy and filling, and while simple, is just the thing I need on hand right now. It takes about 7 minutes to put together and maybe that is the sort of time frame you're cooking in these days, as well. It may be a little snoozy around here for the next couple weeks as we get things up and running in a new kitchen but we're excited to emerge on the other side. Until then. This salad is pretty crunchy. I'm still eating from the bowl on day three and don't find it soggy at all. That said, it would be great for a plane ride or delivering to a new mom/sick friend etc. It's a sturdy one. I added parmesan because it holds up, but feta or goat cheese will work here too. It's pretty simple, change as you wish. 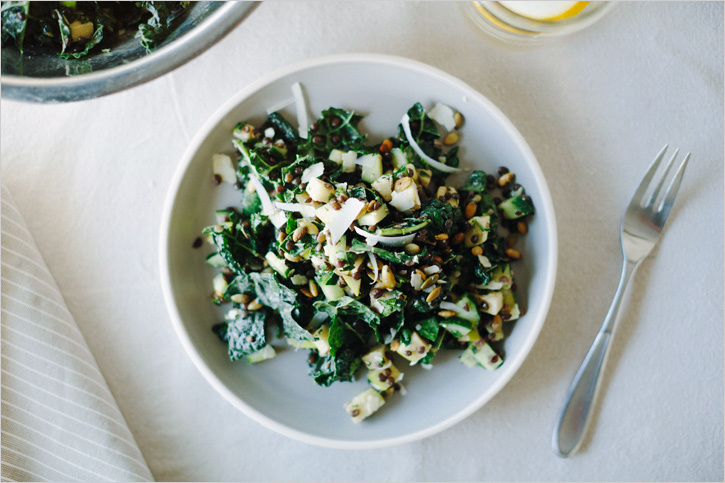 In a large salad bowl, combine the kale, parsley, lentils, apples, cucumber, pepitas and parmesan. For the dressing, blitz everything in a food processor or blender, with salt and pepper to taste, until the garlic is smooth. Pour the dressing on the salad and toss well to coat. Garnish with more parmesan if you wish. The salad will keep in the fridge for a full day and slowly loose it's crunch from there. I knew it would work it's way into my writing at some point, but I have yet to mention here that I spend some of my days working at Trader Joes. While the blog and cookbook are my love and dream, I really enjoy being around people, having that routine and the great healthcare benefits :) This is relevent because I spend a majority of those days at the demo station. If you shop at a Trader Joes market you know the sample booth in the back. Everyone loves a free snack, it's a popular corner. I waver between loving and hating it, for reasons that those who have worked in the service industry can likely relate to. As you may assume, I meet a lot of people in the work of giving away free food. I've explained food allergies and a number of diets, I've walked aisles helping an older fellow just learning to cook for himself, whose wife had passed days earlier and I've planned a romatic dinner menu for a man surprising his wife. But I also meet people who solely have mac n' cheese and frozen orange chicken in their carts, some who refuse to cook with anything but microwave, or those enraged that in mid-December, our strawberries are white (the NERVE!). I have seen and heard the gamut of relationships that people have with their food. I love ice cream and dark chocolate peanut butter cups as much as the next guy, but eating well is your responsibility. Sometimes I want to scream from behind that corner, it is not always easy or quick or cheap or tidy but you taking care of your insides is important. Period. The more I hear, the more I am thankful for good food. I'm thankful that I have been inspired to learn to cook, that I enjoy the process, that we can afford good quality ingredients, and the knowledge to know the difference. 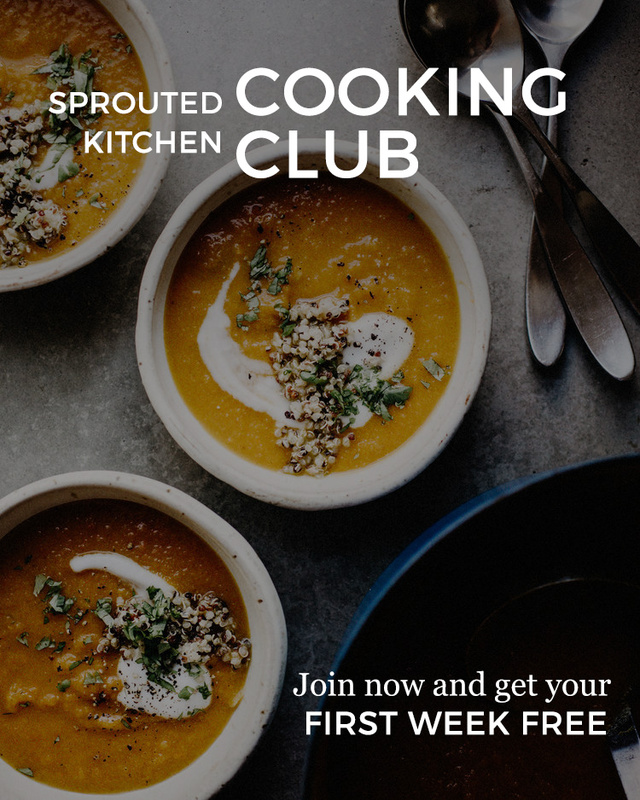 I have a community, you people, who engage me in this passion and send me emails and leave comments that you care about good food too and that makes me want to share it. Thank you for nurturing this in me. Yes, we offer you recipes and photos, but you give me so much. Wishing you a Christmas filled with wonderful food, even better company and time to soak it all in. I am bringing this salad to two Christmas meals as I imagine it will hold well. Everything can be prepped in advance, kept in bags and then tossed all together when it's time for dinner. It's a simple salad, so take the liberty to add some toasted nuts, shaved asiago or chopped hard boiled eggs if you want to make it even more filling. As with most things around here, alter to your taste. Put a drizzle of olive oil in a pot and add the quinoa to toast over moderate heat for two minutes. Add 1 1/3 cups water and bring it to a boil. Turn it down to a simmer, cover and cook for about 15-18 minutes until the liquid is absorbed. Fluff the quinoa and set aside to cool. On a rimmed baking sheet, toss the sweet potatoes with the olive oil and hearty pinches of salt and pepper. Bake in the upper third of the oven for about 25 minutes until golden. Let them cool. In a large bowl, whisk together the cider vinegar, mustard, olive oil and pinch of salt and pepper. Add the cooled quinoa, potatoes, apple, greens, parsley and onionand toss everything to coat. Serve immediately. I am familiar with the way I cook and eat, but am aware it's not mainstream. For the next few weeks, we're talking "pantry goods", and this post I'm sharing some notes on sweeteners. Forgive me if I am repeating information you already know, but I'm hoping to level the playing field here. It makes me squimish to write as an authority on this, as I have no formal nutrition degree, but I want to share how these natural sweeteners work in my kitchen, and why I find them better choices than plain white sugar. None of these sweeteners are "diet foods" or "low calorie" but I find them to be less processed than the alternative. There are certainly more than what's listed below, but these are what I find in constant rotation around here. 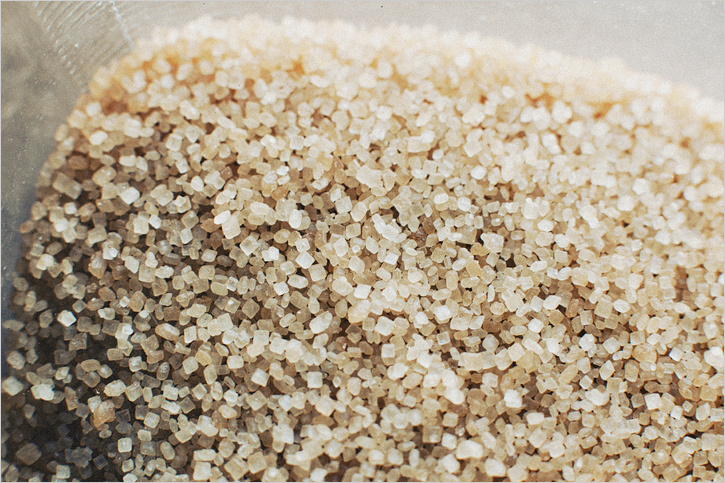 Organic Natural Cane Sugar: This is the closest relative to "plain white sugar", and is defined as pure evaporated cane juice. It retains any natural occuring nutrients and minerals. Plain white sugar is bleached or refined, and clarified by bone char (why some vegans/vegetarians won't eat it). It is easy to find at any conventional market these days. Muscavado: I use muscavado in place of brown sugar as an equal exchange. Some resources say you should reduce the moisture content a bit, but I find this to be unnecessary. Its texture is moist, much like refined brown sugar, and you can purchase it in light or dark varieties.The flavor is complex and caramel like, making a great substitute in baking. It retains it's natural minerals, as the molasses has never been drawn out of it in the first place. Standard brown sugar is refined, and then the molasses is added back in to make it brown. You can find muscavado at specialty markets, or buy it here. Turbinado: You know this most popularly as "Sugar in the Raw", they have it in little packets at Starbucks and restaurants, it is a coarse natural cane sugar. It's made by crushing raw sugar cane and pressing out the juice that has all the vitamins and minerals in it. This juice is then dehydrated in a centrifuge to produce larger crystals. It makes an excellent topping to loaf cakes or cookies because it stays crunchy and adds a nice texture. I also like it in granola or a crumble topping because of this. Turbinado is easy to find at a conventional market. Sucanat: The consistency of sucanat is pretty unique, it resembles sand and it quite dry in texture. It doesn't work in places you need a smooth sweetness, like whipping cream, as it's texture is too dry. It is produced in a similar way to turbinado, except the juice is heated to a syrup, then hand paddled to dry it out. Because it has all of it's natural molasses, it has a good amount of iron, B6, calcium, and potassium. I've read that it is great for homemade bbq sauce, but I use it mostly for baking. My cookies err on the side of "textured" anyway, typically with oats, chocolate chunks and dried fruit, so it fits in perfectly. You can find it at natural food markets or here. Date or Maple Sugar: Dehydrated versions of their respective ingredients, these sweeteners are considered "whole foods" as there is nothing added or taken away. The maple, for example, is heated and then stirred to dry, sort of like turbinado. They don't dissolve into liquids without heat, but they can be substituted 1:1 for plain or brown sugars. The tastes resemble date/maple with their deep flavor, so use accordingly. You can find them at natural food markets or here. Ashley's cocoa with maple sugar looks delicious. Honey: Believe it or not, honey does have a season. In the summer and fall, you are going to get the freshest honey when buying it at a local farmers market. Not to say it goes bad, just an interesting note. Bees are essential for our food system, so if you are able to buy it from a local beekeeper, do it. There is usually someone with honey at a farmers market. Honey's unique composition makes it an immunity builder, helps with allergies, anti-microbial, an antioxidant and a remedy for a number of health ailments. It dissolves easily into liquids with a bit of heat and can be used in baked goods. There is a resource through The Honey Locator to find places near you. Agave Nectar: There are differing opinions on whether agave is as "unrefined" as it is marketed to be. Because it has a high concentration of fructose, some research doesn't find it so great, and with enough googling, you can look into it yourself, I'm not one for conflict. It is extracted from the agave plant, and comes in light, dark and raw varieties. It is said to be lower on the glycemic idex than regular sugar, so it doesn't spike your blood sugar as quickly. It is slightly sweeter than a dry sugar, and doesn't have a strong flavor making it pretty versatile. Because it dissolves easily into a liquid, I often use it in oatmeal, cocktails, dressings, marinades and what not. Agave is easy to find and they have a great price at Costco/Sam's Club if you use it frequently. Maple Syrup: REAL maple syrup is from the sap of a sugar maple tree. You can purchase it in Grade A or B, the former being a more gentle flavor and the later having a deeper maple-ness to it. I usually go with B, and both are a good source of manganese and zinc. The good stuff can be fairly pricy and since it lasts so long and I use it often, I buy a big jug to save money. I use it as a sweetener for granola and Heidi's peanut butter cookies are spot on. Brown Rice Syrup: This sweetener is made from fermented brown rice, and then heated to make a thick syrup. It is a complex sugar, which means it is broken down and absorbed more slowly into the blood stream. I use it in granola bars and rice krispy treats, but have read it’s a great sweetener for coffee due to its mild flavor and how well it distributes in liquid with heat. I use it as a sweetener for frozen yogurt in our cookbook and love the gentle flavor it contribute there. You can find is at natural food markets or here. ** Though they all contribute sweetness to a recipe, the dry vs. liquid sweeteners cannot be substituted exactly. As a very general rule, if you want to use a liquid sweetener instead of a dry, you need to scale back the moisture in the recipe back by 1/3 or add 4 Tbsp. of a flour to compensate. If you want to use a dry instead of a liquid sweetener, cup for cup, add 1/3 cup more liquid to the recipe. Again, all of these notes are based on opinion with some help from Wholesome Sweeteners and SparkPeople. Bea's cookbook, as expected, is quite gorgeous. There are a good amount of dessert recipes along with stunning and creative dishes featuring fresh vegetables. Though not marketed as such, she cooks gluten free, so the recipes call for a few unique flours and such, but they are worth the trip if you don't stock them normally. Sweet stories, thoughtful recipes, the book is a beauty. I only made a few changes based on the fact that I didn't have vanilla bean or cinnamon sticks on hand, but either way, this is a super easy and tasty dessert. Preheat the oven to 350'. Combine the dried fruit, pistachios and almonds in a small bowl. Stir in the cinnamon and set aside. 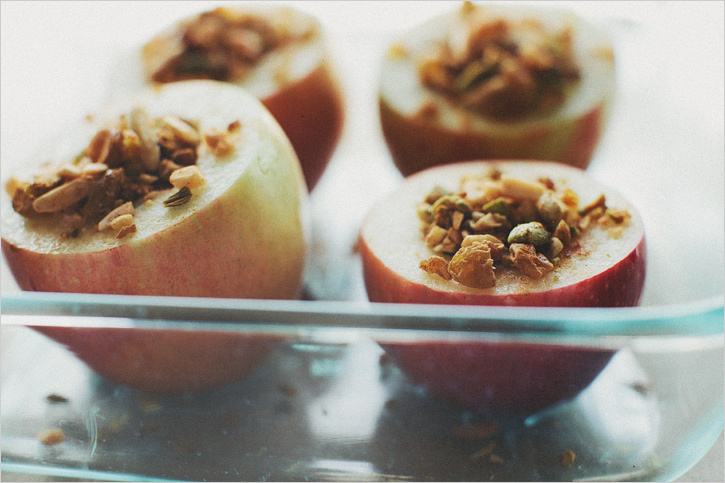 In a saucepan, combine the apple juice, vanilla extract or seeds of the vanilla bean and lemon zest. Bring it to a simmer for 5 minutes for everything to infuse. Turn off the heat and let it cool. Core the apples and cut about 1/4 of the top off, reserving the tops (I used a melon baller to scoop out a bit of a pocket in the apple core, this is optional). 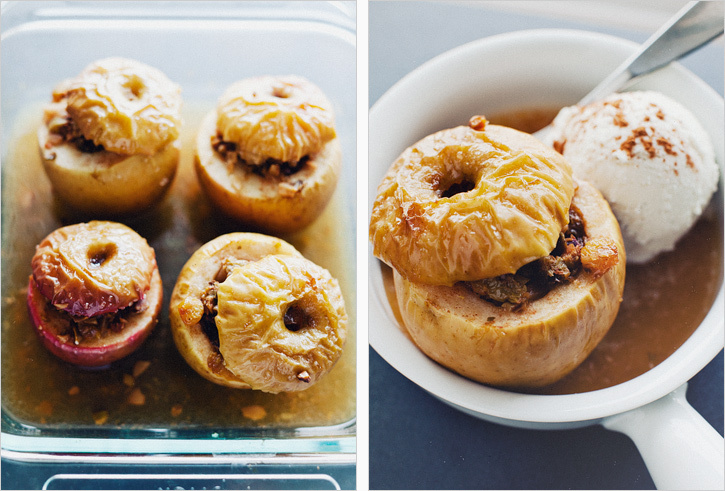 Put the apples in an ovenproof dish. Divide the nut stuffing between the apples and cover them with their tops. 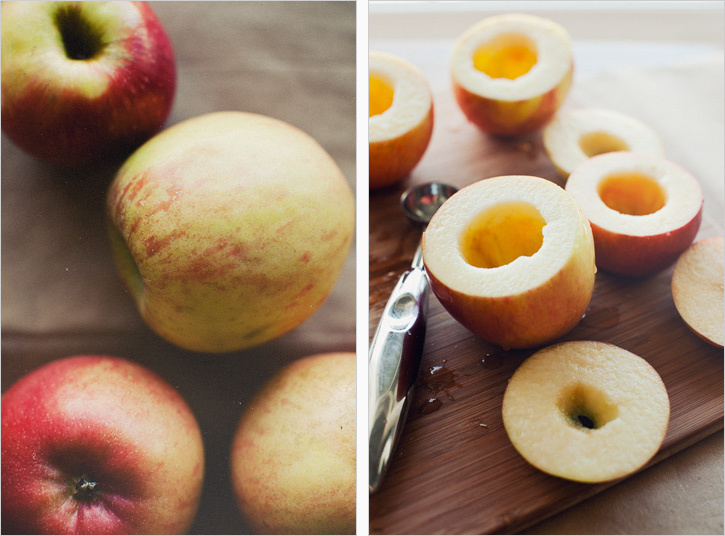 Pour the infused juice and oil over the apples and sprinkle with the sugar. Bake for one hour or until the flesh is tender, regularly drizzling with the cooking juice. Remove from the oven and serve warm with the juices and plain yogurt, whipping cream or ice cream on the side.